This gorgeous and unique hip scarf / belt is made on a sheer mesh base with intricate, ornate embroidery in gold fabric and sequins. 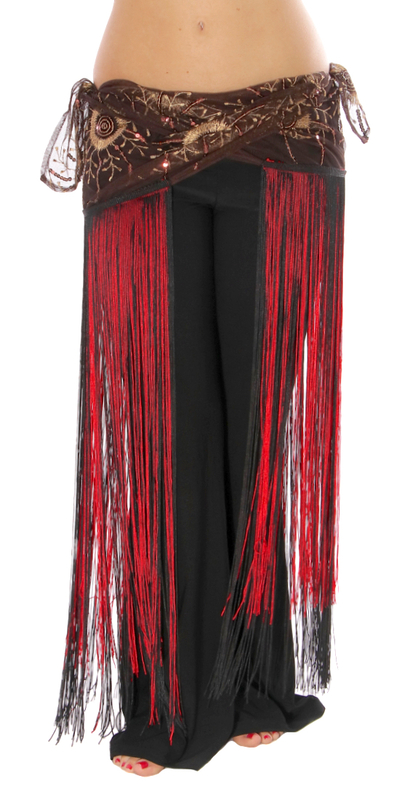 Features two rows of long fringe in red and black. A great addition to any tribal, tribal fusion, or Gypsy costume! This gorgeous and unique hip scarf / belt is made on a sheer dark brown mesh base with intricate, ornate embroidery in gold fabric and sequins. 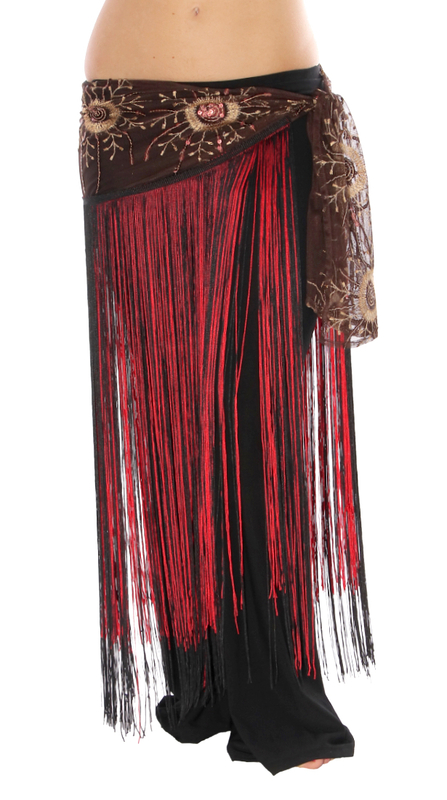 It features two rows of long fringe in red and black, making it a great addition to any tribal, tribal fusion, tribaret or Gypsy costume! 68 - 70 inches end to end; Decorated portion 30 - 32 inches; Length 36 - 37 inches from top edge of scarf to bottom of fringe. The material is synthetic with smooth flowing fringes. The embroidery is somewhat fragile. It makes an appealing accessory maybe not for every day drills but for a performance, once in a while workshop or choreography in a group. Looks exactly as shown in picture, perfect length and nice movement when dancing. 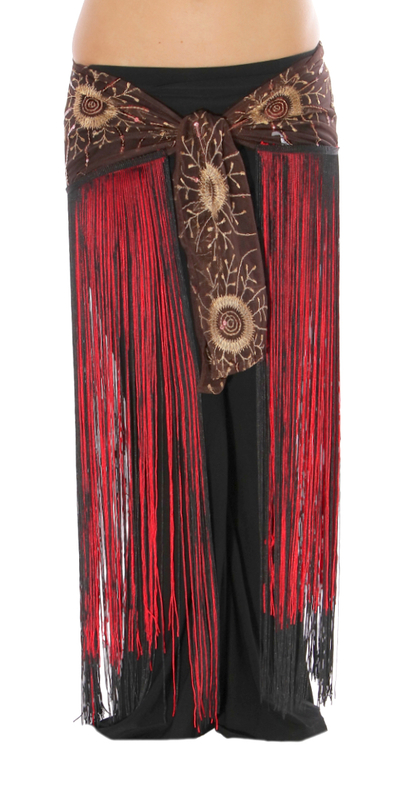 Q: I am interested in 18 of the gypsy fringe scarves in the long red/black fringe. It says you only have 12 in stock. Is there a chance you can get more? We need these for our high school production of "The Phantom of the Opera". Thank you!! Q: Will this belt fit a plus size woman? A: Hi Lisa, Thank you for your question. This beautiful belt measures approx. 73 inches end to end with the decorated portion being approx. 37 inches and it is approx. 38 inches to bottom of fringe. For future reference, you can find product details and sizing information in the Description box located below the photo on the product page. I hope this helps.